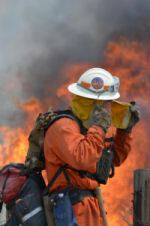 HEAT OF THE MOMENT: Nadin Abbott captured this dramatic image of a firefighter battling the Ranchita Fire. 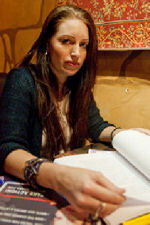 Our hats are off to Nadin, who was at the scene through the night provided vital news updates for area residents. WILDERNESS LOST: Reader Tom Lemon shared this inspirational image of a friend savoring a boulder-strewn terrain in scenic McCain Valley. Sadly views like this are disappearing due to construction of Sunrise Powerlink and soon, the Tule Wind industrial energy facility planned for this formerly protected federal land in East County. HAWK PORTRAIT: Photographer Daren Sefcik shot this stunning close-up of a red-tailed hawk in Anza-Borrego Desert State Park. Hawks and other raptors now face threats from wind turbines erected just outside the park boundary; birds of prey have been killed by the thousands at similar wind facilities elsewhere. 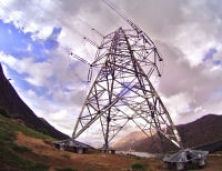 SDG&E’S SUNBIRD: Billy Ortiz hiked up a mountainside in Lakeside to get this birds-eye view of the Sunbird, SDG&E’s massive sky crane helicopter used to erect the Sunrise Powerlink high voltage towers. 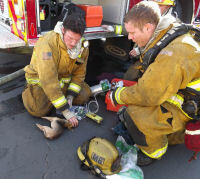 HEROES IN ACTION: Monica Zech, public information officer for El Cajon, sent in this image of firefighters saving the life of a dog found near death after a residential fire. 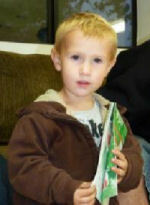 SHOCKEY FIRE’S YOUNG VICTIM: Miriam Raftery shared this photo of Ray Ritter, a toddler whose family lost their home in the Shockey Fire that devastated the Boulevard and Tierra del Sol communities. 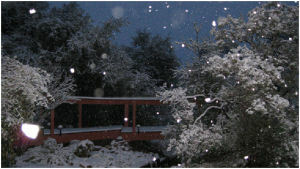 A FAIRYTALE SCENE: Reader Nancy Manning sent us this enchanting image after a snowfall transformed rural Descanso into a winder wonderland. 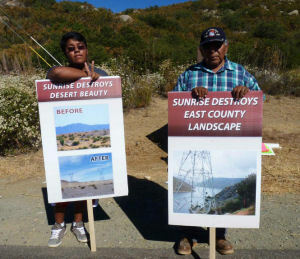 BROKEN PROMISES: ECM editor Miriam Raftery captured the emotions of Native Americans from Viejas and other local tribes, who voiced anguish and outrage over Pattern Energy’s Ocotillo Express wind project. The massive facility was approved despite objections over desecration of sacred sites, artifacts, ceremonial places and ancestral burial grounds. DALAI LAMA AT SDSU: Photojournalist Ron Logan snapped this portrait of esteemed religious leader, the Dalai Lama, sporting an SDSU baseball cap as he delivered his message of peace to students at the campus. 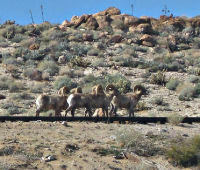 BIGHORN RAMS: Linda Ewing sent this stunning image documenting endangered Peninsular Bighorn Sheep walking the rails in the heart of the Ocotillo Express wind project – a site that the U.S. Interior Department previously de-listed as critical habitat for these magnificent animals whose habitat is being encroached upon by industrial wind projects in both San Diego and Imperial Counties. VALLECITOS LIGHTNING FIRE: Award-winning ECM photographer Jim Pelley shot this dramatic image of a massive wildfire ignited by lighting; the blaze scorched thousands of acres across East County. 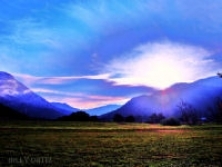 MID-WINTER SUNRISE: Award-winning ECM photographer Billy Ortiz captured this magic moment in Lakeside’s El Monte Valley one January morning. 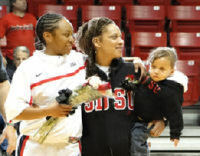 THE THRILL OF VICTORY: ECM sportswriter Ryan Schuler provided this image of SDSU basketball athletes savoring the moment after the team clinched the Mountain West Championship. 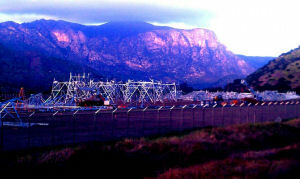 INDUSTRIALIZATION OF OUR BACKCOUNTRY: ECM intern Mia Myklebust won a San Diego Press Club award for her efforts documenting industrial energy projects in a story titled “Jacumba: A Town Surrounded.” This image depicts construction of Sunrise Powerlink and a fly-yard established for the project. 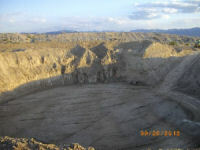 POWERFUL IMPACT: Jim Pelley reveals the depth of desert destruction from a single wind turbine foundation excavation, which dwarfs nearby mountains considered sacred by local tribes. 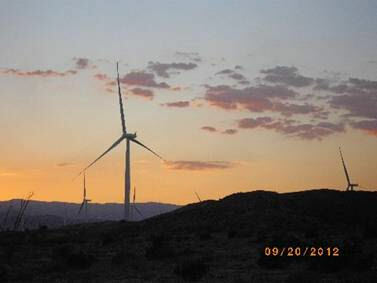 More than 100 turbines are being built on this formerly protected 12,500 acre site in Ocotillo, where the developer claims the project will have minimal impact and is compatible with multiple uses allowed on U.S. Bureau of Land Management public lands. 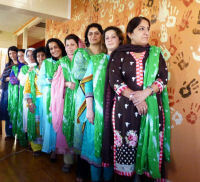 PEACE MISSION EMISSARIES: A delegation of Pakistani women came to the U.S. to deliver a message to political leaders and the American people, imploring a stop to aerial drone attacks that are killing innocent civilians as well as terrorist targets. 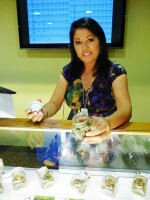 ECM editor Miriam Raftery took this photo in an exclusive interview with the women during their stop in San Diego. DREAMS DESTROYED: ECM award-winning photographer Nadin Abbott shot this image of a charred child’s toy amid the ashes of the family’s home, which was destroyed in the Shockey Fire. 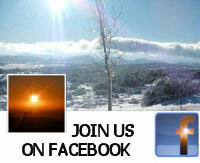 SUNBURST AFTER THE STORM: Jim Pelley captured this inspirational image in the desert near his home in Ocotillo. This view is gone forever, replaced by towering wind turbines that have obliterated desert vistas visible from San Diego’s mountains and Anza-Borrego Desert State Park as well as the town of Ocotillo just over the county line. DEATH OF THE DESERT: Jim Pelley documented the devastation in Ocotillo, where Pattern Energy bulldozed a century-old grove of giant ocotillos in the name of “green” energy. A similar project is planned next in McCain Valley, also on formerly protected federal land. 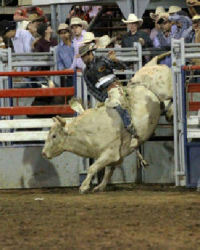 RIDE ‘EM , COWBOY: Barry Claessens caught this action at the Bulls Only Rodeo in Lakeside, where skills in roping and riding are exhibited, harkening back to East County’s wild West roots. 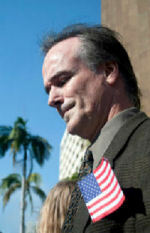 AN UNLIKLEY OCCUPIER: What would compel a La Mesa man to join Occupy San Diego and brave arrest to protest the banking/mortgage industry in which he was once a professional? Photojournalist Ron Logan provided an intriguing profile of Mike Garcia. POINTS TO CONTEMPLATE: Philosophy students at Grossmont College’s 50th anniversary celebration prepare for their presentation; photo by ECM editor Miriam Raftery. 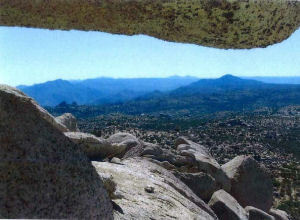 A HIKER’S VIEW OF MCCAIN VALLEY: Charles and Laurie Baker sent in this panoramic vista of McCain Valley, soon to become a wind farm. BOBCAT BABIES: It’s rare to see wildcats, and even rarer to spy a family of three. Billy Ortiz spotted this mother bobcat and two kittens in Lakeside’s El Monte Valley. TRIBAL VIGIL: ECM photographer Jim Pelley was among residents honored with an invitation to join Native Americans from multiple tribes at a solemn all-night vigil mourning the loss of their ancestors in Ocotillo, where a wind energy project has been built atop the place known as the Kumeyaay’s Valley of the Dead. 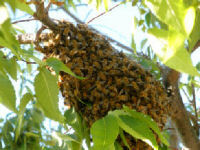 HERE’S THE BUZZ: Robert Gehr took this photo of a bee swarm; local entomologists now estimate the majority of local bees have cross-bred with the aggressive African “killer” strains. THE WOMAN WHO STOOD ALONE AGAINST THE BIG BANKS: Ron Logan took this illuminating image of California Attorney General Kamala Harris, who announced her big win for consumers over big banks at the California Democratic State Convention in San Diego. PRIMARY VICTORIES: Carl DeMaio and Bob Filner relished their June primary wins, as shown in these images taken by Tom Abbott and Miriam Raftery. 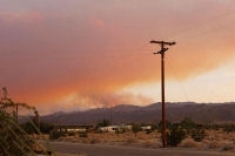 WHITE WASH: Jim Pelley documented flammable chemical used for dust suppression, which washed onto lawns in Ocotillo from Pattern Energy’s project. 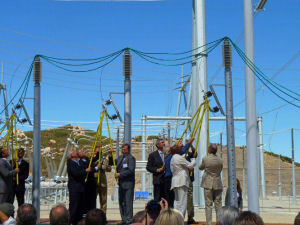 POWERING UP: Governor Jerry Brown and ex-Governor Arnold Schwarzenegger teamed up to turn on the power at the new substation in Japatul Valley near Alpine; photo by Miriam Raftery. 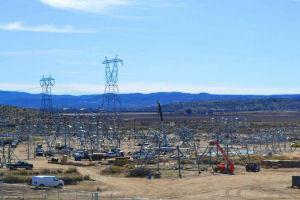 BEAUTY BLEMISH: Milt Cyphert shot this twilight image of gleaming Powerlink towers awaiting installation at Lakeside’s El Cajon Mountain, known as El Capitan for its resemblance to the Yosemite landmark of the same name. 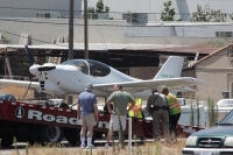 SAFE LANDING: When a pilot of a small plane made an emergency landing on Highway 67 near Gillespie Field, Billy Ortiz was on hand to capture the moment. 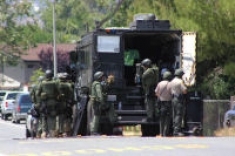 SWAT STAND-OFF: When the SWAT team rolled into Lakeside, Billy Ortiz was there to catch the action. Fortunately this stand-off ended peacefully. WORKPLACE NIGHTMARE: Parke Ewing shot this photo of workers forced to stay on the job during a dust storm engulfing the Ocotillo Express Wind site. 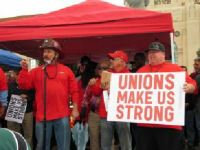 WORKERS FLEX SOME MUSCLE: 2012 was a big year for union members in San Diego County—including wins in key local races as well as defeat of Prop 32. Nadin Abbott shot this photo of union members speaking out at a San Diego rally that included workers from across our region. UPSET IN THE 50TH CONGRESSIONAL DISTRICT: Concern is evident on the face of Republican Brian Bilbray on election night in this photo by Tom Abbott. At the time, Bilbray knew his election was too close to call; he later lost his Congressional seat by a narrow margin to Democrat Scott Peters. THIS WAS YOUR LAND: Billy Ortiz hiked the length of Sunrise Powerlink through Cleveland National Forest, chronicling its dramatic impact on our public lands including this image at Lake Jennings. EAST COUNTY ACTIVIST: Carrie Christie launched an effort to free Sara Kruzan, who was convicted of killing the pimp who raped her. Ron Logan captures Christie’s determination in this photo. FIGHTING FOR THEIR ANCESTORS: These children from the Viejas tribe were among those who took a “Stand in the Sand” at a protest seeking to halt the Ocotillo Express wind project. Photo by Miriam Raftery. HOW BIG IS A WIND TURBINE? 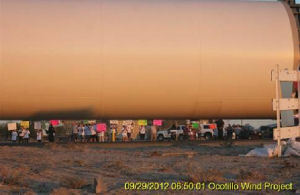 Jim Pelley found the right camera angle to give us some perspective, photographing protesters dwarfed beneath a giant section of a wind turbine being transported. 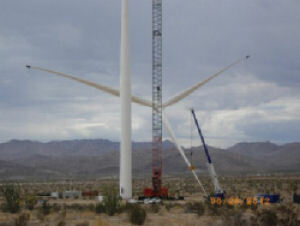 A GIANT RISES: Pelley also was on hand to photograph assembly of the first turbine erected at the Ocotillo wind site. 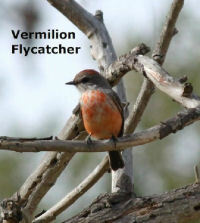 RARE BIRD: “Bird Talk” columnist Greg Dunne snapped this image of a vermillion flycatcher—a rarity in San Diego County—at Lindo Lakes in Lakeside. 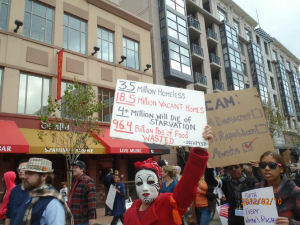 THE 99%: Nadin Abbott photographed Occupy San Diego protesters outside the state Democratic Convention in San Diego. WASTE SITE FIRE: Billy Ortiz raced to the scene of this fire at the Waste Management facility in El Cajon, where 500 tons of trash had to be removed by firefighters battling the blaze. 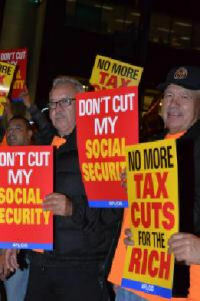 SENIORS SPEAK OUT: As Congress edges toward a fiscal cliff and contemplates cuts to entitlement benefits, local seniors and workers staged a rally with a clear message: hands off Social Security and Medicare. Photo by Nadin Abbott. GONE TO POT: Miriam Raftery toured the county’s first medical marijuana facility to be legally licensed by the Sheriff, however the federal regulators shut down the Mother Earth clinic in El Cajon soon afterwards. 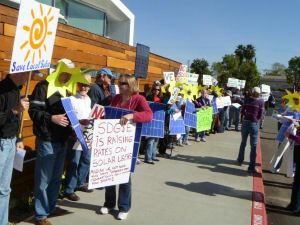 SUN LOVERS: Bob Silvern sent in this photo of citizens protests against a proposed solar energy tax sought by SDG&E. 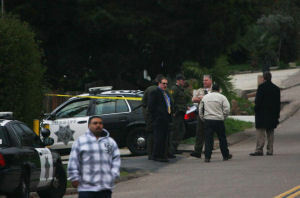 TRAGEDY IN LAKESIDE: Stunned neighbors struggle to comprehend one of the year’s most unfathomable crimes, the stabbing death of a young Lakeside boy by his 10-year-old friend. Photo by Dennis Richardson. ROCKS OF AGES: Melody Ponchot sent this image taken at Valley of the Moon, a rugged landscape east of Jacumba. HISTORY PASSING BY: This one’s not East County or San Diego. 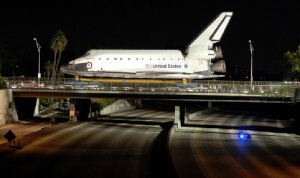 ECM photographer traveled to Los Angeles to commemorate the historic final journey of the Space Shuttle Endeavor, immortalizing the moment with this dramatic photograph. 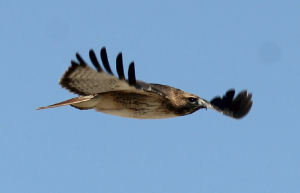 HAWK IN FLIGHT: Jim Pelley shot this stunning image of a hawk in flight over the desert near year’s end. 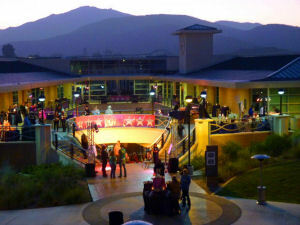 MOUNTAIN SHADOW: Tom Lemon caught this optical illusion from Mount Helix. 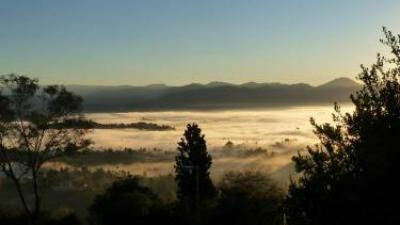 No, that’s not a real mountain rising through the morning fog. It’s the shadow of the mountain, cast atop a pink-tinged sea of clouds. 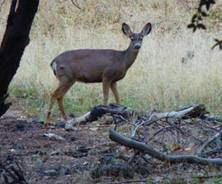 OH DEER: ECM editor Miriam Raftery spotted this doe while driving through Rancho Cuyamaca State Park on a late December afternoon. 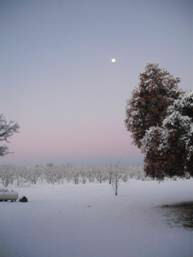 SNOWY SUNRISE: Melody Ponchot arose early to photograph this winter wonderland sunrise at her ranch in Boulevard. 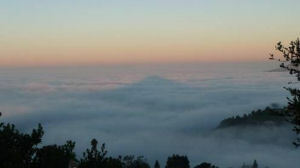 ALL IS CALM, ALL IS BRIGHT: Tom Lemon photographed this dream-like scene of golden clouds viewed from above, on Mount Helix. THE NEW VIEW IN OCOTILLO: Parke Ewing shot this image of the Ocotillo Express wind project; turbines 500 feet tall now dwarf mountain ranges beyond. 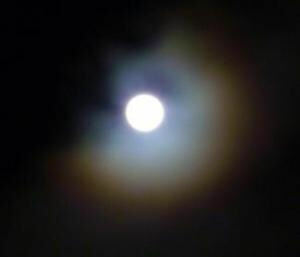 MOON HALO: Miriam Raftery captured this unusual astronomical occurrence, caused by light reflecting off ice crystals high in the atmosphere for an iridescent effect.